Here at VenueBook, we like to keep up with our friends in the hospitality startup community, especially those backed by strong missions, bright minds and a passion for solving problems. Say hello to our friend, Propared. Propared is a cloud-based platform revolutionizing how production and theater organizations manage show and event logistics and communications. They make it easy for people to come together, just like VenueBook. Solves an Existing (and very annoying) Problem: Much like Kelsey, our VenueBook founder, Ryan couldn’t find the right solution, so he built his own! After years of venue and theater management, Ryan developed the Propared production management software through a keen knowledge of everything needed to manage shows - and stripped away everything unnecessary. 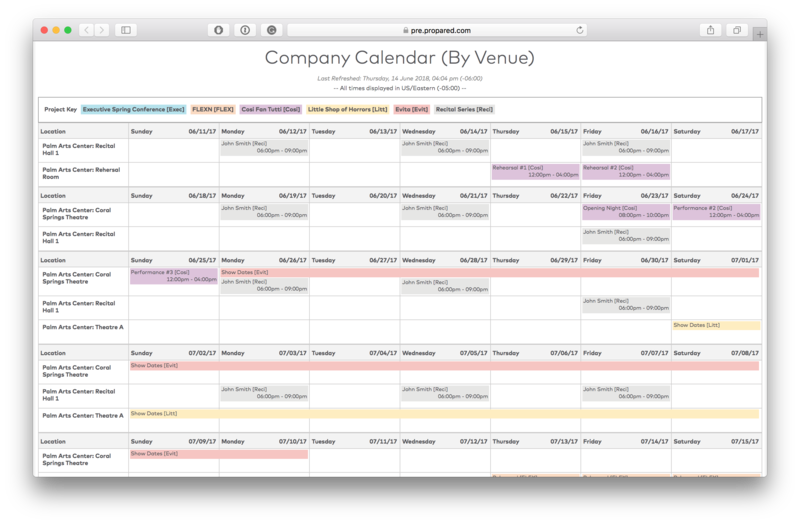 Our favorite feature is the slick calendar; you can build limitless calendars and schedules to organize multiple productions and venues simultaneously and seamlessly. Follows the Path of Least Resistance: Propared centralizes a show’s back of house operations by acting as a true system of record. Unlike other platforms, Propared integrates into the preexisting systems of production teams and vendors like Outlook and Google. Information is passed without redundant data entry, usernames, and passwords. Timing is Everything: Every communication between people could lead to changes in the overall show timeline. This means everyone needs to be on the same page, which is a vital aspect when working with a razor-thin margin of error. Propared’s Master Timeline allows your deadlines and schedules to live side-by-side. Now you can quickly pull everything related to a person or department into a single schedule. Don’t lose another minute. Propared is our software sister from another mister. We both agree that the growth of arts and events programs starts with a smart software. Once you’re able to organize what’s already on your plate, only then can you add more business and do it well.